Wisconsin will continue to head in the right direction. Governor Scott Walker has been re-elected. Now that the votes have been tallied and the dust has settled – it’s a great time to reflect on what it took to win. A week before Election Day, we were all nervous. Cautiously gauging our strengths and sending emails to encourage friends and family to vote. I sipped my coffee and read the reports coming out of Wisconsin: Walker was locked in a dead heat. I knew that American Majority Action was going door-to-door in Wisconsin, encouraging voters to turn out to vote. A few phone calls and emails later, I connected with their local headquarters and assembled a group of activists who emphatically agreed: Walker must stay. We can’t allow extra-legal investigations and well-funded opposition to our free market ideas take him down. Travel was booked from Florida, North Carolina, New York, Montana, and Washington D.C.. We all wanted to be a part of the Walker three-peat. But what exactly does it take to win? 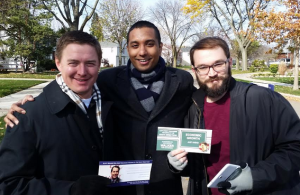 We descended into cold and windy Wisconsin just in time to hit the doors for the weekend. AMA has a sophisticated grassroots operation in place and we seamlessly got on board. Equipped with mobile devices, walk lists, pro-Walker literature, and heavy coats, we set out into the suburbs of Milwaukee. Responses such as, “How is Walker going to help the middle class?” really taught me the importance of engaging with voters. Talking points don’t cut it when there are real people trying to make decisions for themselves and their families. 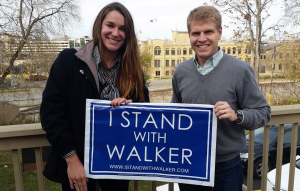 I was struck by those who hissed “I’m a union man” or “I’m a teacher” when asked if they would support Walker. One wonders if it is impossible to both work in education and care about increasing choice for parents, fighting rising tuition costs, and supporting charter schools. 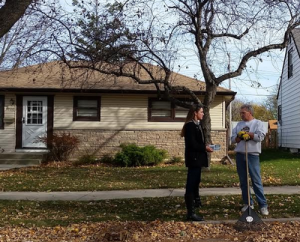 Dogs lurched from front porches, elderly women slammed doors in our faces, and pejoratives were hurled, but we continued to walk the precincts and talk to Wisconsinites about the future of their great state. It feels great to win, but that’s not everything. American Majority Action knows that politics is local. They understand the dire need for conservatives to get dirty and do the real work required to win. Victory doesn’t happen overnight. I am proud to have served alongside Matt Batzel and his team. They have been investing in Wisconsin for several years and it’s clear that their work has paid off.